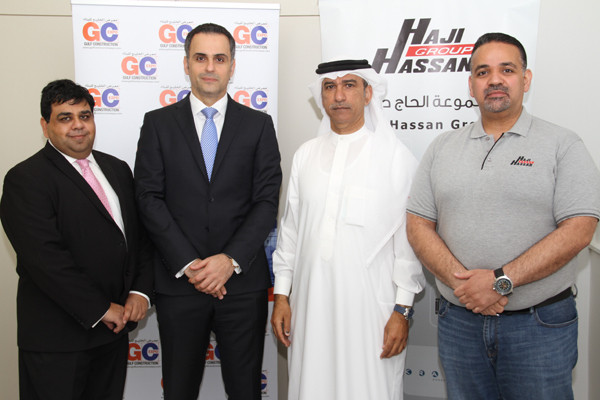 Haji Hassan, a leading diversified construction-focused group, has signed up as a strategic sponsor for Gulf Construction Expo, the leading construction and building event in the Northern Gulf region, which kicks off on April 23 at the Bahrain International Exhibition and Convention Centre. The three-day event is being held under the patronage of HRH Prince Khalifa bin Salman Al Khalifa, Prime Minister of the Kingdom of Bahrain, said the event organiser Hilal Conferences and Exhibitions (HCE). Haji Hassan Group, headquartered in Bahrain, is a conglomeration of complementary businesses which have been serving the construction and industrial services sectors in Bahrain and the GCC since 1952. Group deputy chairman Waheed Hassan Al A'ali said: "Our Strategic Sponsorship support for Gulf Construction Expo delivers on two goals for the company. Firstly, we look to promote the world-class capabilities of Haji Hassan which has been built with over 67 years of expertise and investment in our facilities; and secondly we see Gulf Construction Expo as an important showcase to present Bahrain as a leader in quality building materials." Amongst the group’s companies represented will be the Arabian Parts Company, Bahrain Asphalt, Arabian Chemical Industries (Isola), Haji Hasan Ready-mix, Bahrain Pipes, Bahrain Precast Concrete, Bahrain Blocks and Haji Hassan Reinforcement, he stated. Each entity specialises in essential resources for the construction sector such as building materials, precast concrete, readymix concrete, plastic and sewage pipes, construction chemicals, concrete blocks, steel reinforcement, rubber and mechanical engineering spare parts. The Haji Hassan Group has an impressive track record of delivery on high-profile construction projects in the kingdom. These include Bahrain International Airport, American University of Bahrain, Ikea Bahrain, Bahrain Marina, Fontana Infinity, Alba Potline 6, Ramli Housing, Marassi Al Bahrain, Jasra Interchange, Diyar Al Muharraq and Al Shamaliya Housing. On the partnership, HCE managing director Jubran Abdulrahman said: "Haji Hassan has, for over 60 years, been a leader and pioneer in the region in the building materials sector. We are proud to have the support of a Bahraini company that has been so instrumental in the growth and development of construction projects in the GCC." "Gulf Construction Expo also carries the organisational support of Tamkeen alongside sector sponsors Universal Rolling for the Metal and Steel sector and Amna Politerm Blu covering Green Technology," he stated.